Since 1997, Majors Home Improvement has been dedicated to enhancing the homes of residents in Destin, Florida, and across the Panhandle region by installing vinyl replacement windows and other products. We are committed to providing a positive renovation experience, which is why we always ensure our customers receive Red Carpet Service when working with us. This means you can expect more than just factory-trained craftsmen who deliver expert installation service. We also promise to be respectful of your home and landscaping, take care to lower the stress of your pets, and leave your home cleaner than when we arrived. At the end of the installation, a project manager will walk you through the work we did to ensure your satisfaction was met. The windows we install for you will be custom manufactured, and you’ll be able to design them to meet your aesthetic preferences. Choose from numerous styles, exterior colors, interior wood-grain finishes, hardware, grid and glass designs, and more. 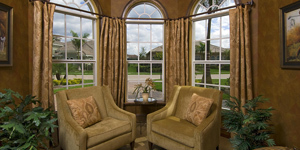 To learn more about our vinyl replacement windows, contact Majors Home Improvement today. When you do, we’ll be happy to schedule a complimentary consultation at your home in Crestview.